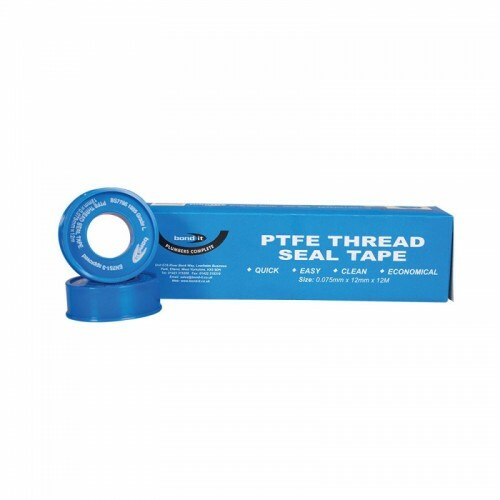 A non-adhesive plumbers PTFE tape, suitable for use with thread fittings. For thread sealing of plumbing pipe work. Suitable for use with plastic, brass and other metal fittings/ pipes. Ideal for radiator tails and male tapered pipe threads. NB. Not suitable for use on gas pipes. Conforms to BS6920 and UK WRAS listed. For thread sealing of plumbing pipe work. Suitable for use with plastic, brass and other metal fittings/pipes. Ideal for radiator tails and male tapered pipe threads. Tape density: 0.4g/cm³. Ensure surfaces are clean, free from dust and dry. Remove outer packaging from roll of tape. Unwind a small amount of tape from the spool and apply to joint, use the spool to unwind the tape, pulling firmly after the first revolution to secure tape. Ensure the tape does not cover the edges of the thread as this can break off and flow into water system. Simply pull the tape when application is complete and it will break off neatly. If the tape does not lie flat on the thread, press and smooth it down before connecting pipework.